According to B S Iyenger, "Savasana when properly performed brings on a silent state of stillness which is divine." At the end of every yoga class, you know those few minutes when you're asked to lie down straight, with your legs placed apart and arms by your side. It is a moment when you oscillate between relaxation and blissful sleep by performing an ancient yoga asanaknown as Shavasana or Savasana (pronounced as Shuh-vaas-ana) that takes its name from two Sanskrit words 'shava' which means cobra and 'asana' which means post. How hard could relaxing on the floor be, right? Wrong! It's as hard to master as meditating, chanting or any form of therapy which helps you brace your thoughts and de-stress. Ms. Shaili Singh, who holds a Masters Degree in Yoga & Science of Living from Jain Vishva Bharati Institute and a diploma in Yoga from Morarji Desai National Institute of Yoga, says, "You'd think that Savasana is one of the easiest asanas when in fact, it's probably one of the most difficult ones. You're relaxed but in a state of awareness: you're aware of yourbreath, the different parts of your body and even the tingling sensation that runs through your fingers while you lie there." 1. According to The Hatha Yoga Pradipika, one of the oldest texts on yoga, "Laying down on the ground, like a corpse, is called Sava-asana. It removes fatigue and gives rest to themind." 2. Shavasana is also part of the practice of 'Yoga Nidra', one of the deepest forms of meditation. It's practiced over 45-50 minutes and has proved to shown some real health benefits: reduced stress, a sense of joy, the potential of being complete and an overall sense of well-being. Note: Yoga Nidra, also known as guided mediation is practiced with the help of an instructor. According to the Yoga Sutra of Patanjali, one of the most ancient and reliable sourcebook of yoga, there are two stages of Savasana. 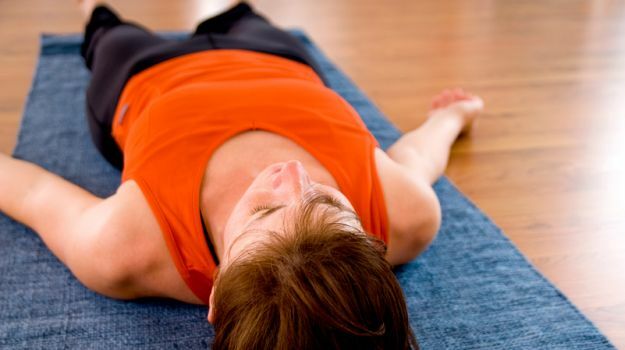 "The first stage of Savasana involves physiological relaxation. In this stage, as you get comfortable, there is first awareness of the muscles gradually relaxing, then of the breath slowing, and finally of the body completely letting go." "In the second stage of savasana, you're withdrawing from the external world without losing contact with it. This withdrawal is the experience of pratyahara. When you're in it, you feel like you're at the bottom of a well. You register the sounds that occur around you but these sounds do not create a disturbance in your body or mind." Now, let's practice how to perfect this pose. 1. The first rule of Savasana is that you shouldn't lie on plain ground but instead use a mat or sheet of some kind. Your surroundings need to be as neat as possible. 7. While doing all of this, try to stay awake and after 4-5 minutes you'll feel this sense of relaxation spreading through your body. For the latest food news, health tips and recipes, like us on Facebook or follow us onTwitter.